When it comes to apparel, I’ve noticed that everyone seems to have a well-worn favorite. I practically live in a Patagonia fleece during winter, and denim cutoffs are a solid staple to my summer outfits. Year round, you won’t find me without pearl earrings, and there’s a pair of Gap yoga pants I can’t seem to part with for movie watching and late-night studying. 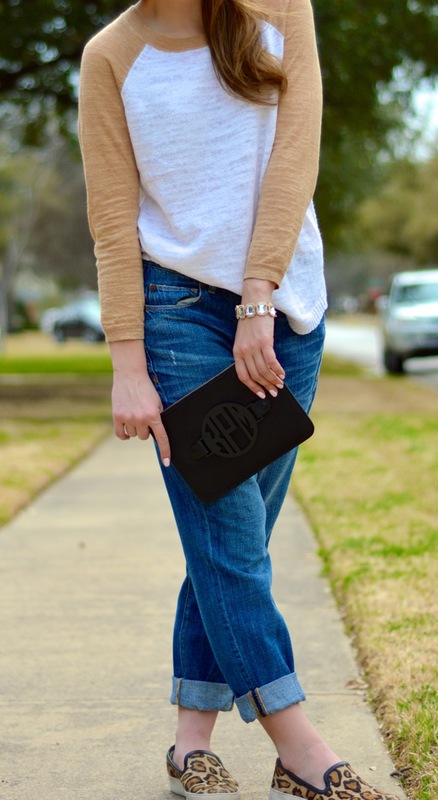 Today, I’m so excited to introduce to you the newest member of my MVP list: the monogrammed, sophisticated, versatile, darling clutch from Grateful Bags. In line with my proclaimed obsession, I couldn’t help myself from showing you not just one, but two of the million and one ways I will be sporting it for… is the rest of my life too dramatic? For the rest of my life. Be sure to check back in on Friday to see my second look with my Grateful Bag! 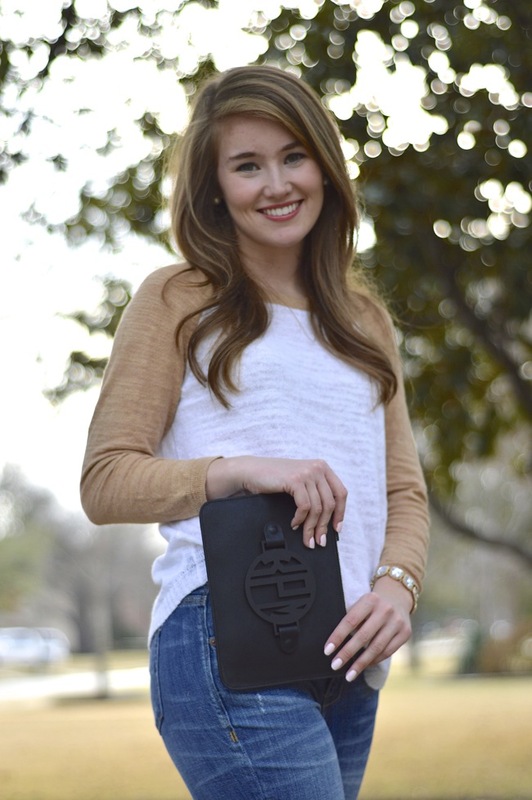 This first outfit was inspired by the chic edge of the clutch – how often do you see monograms in black on black? Black on black leather, I should add. Naturally, pairing it with my favorite cheetah kicks was my first instinct. This light baseball-styled sweater kept things casual while complimenting the shoes. I can’t wait to wear this out for fun dinners while spring evenings still allow for light sweaters. But not gonna lie, I’m even more excited for summer to be in full swing so that I can swap out sweaters for spaghetti straps, and bring along my favorite clutch in tow! P.S. Shopbop is offering 25% off of… wait for it… EVERYTHING through Thursday, and I can’t get this little number out of my head. I’m already picturing it with cowboy boots for concerts and line dancing this summer, and wedges for Sunday brunch…. do I pull the trigger? (I’m thinking yes…:) See more of my favorite, way-on-sale picks below! Kate, you are so so soo stylish! I am obsessed w/ your blog and can’t help but obsess over every outfit you post! Hello, perfect!!! I have a tote bag from Grateful Bags that I adore… but this clutch is fabulous. You will get so much wear out of it in the summer! I CAN’T WAIT to see your pretty face next week!!!!!! 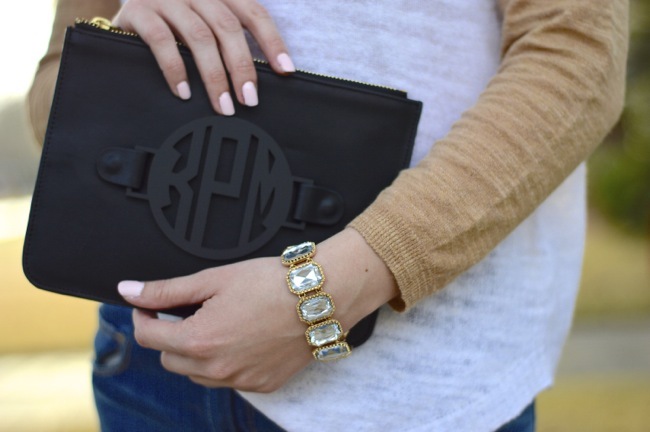 Love the clutch…so cute with the black on black! I also have been eyeing that baseball sweater…just wondering what size you got? I love that it’s slouchy and don’t want to get it too tight! that clutch is amaze, love the black on black and i love how you styled this whole outfit. too cute! What lip product are you wearing?! I am in love with that clutch! 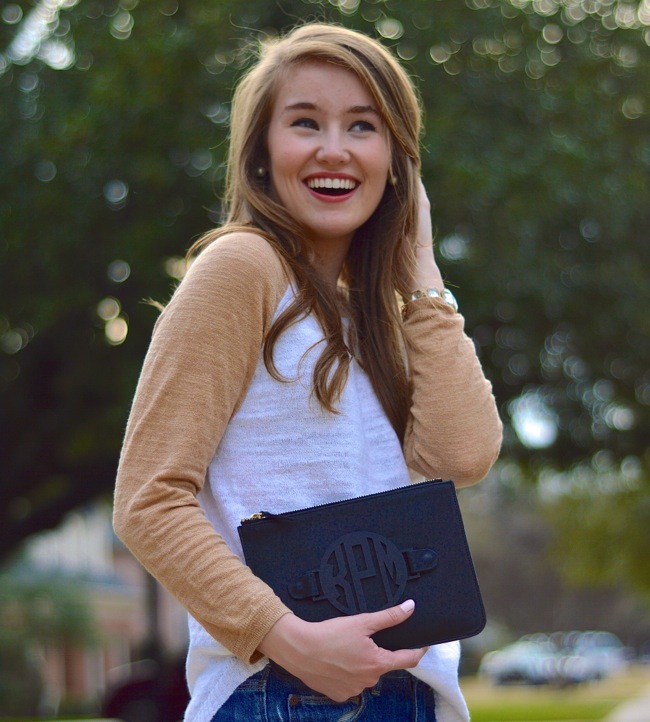 Love that clutch, I love me some monograms! It’s always the best kinda staple to an outfit, and it will always belong to you!